Video Games are the interactive future! The power of video games isn’t quite as cut and dried as we thought! When video games grew popular, it was assumed that people would play these animated games when they were children (when children already play a lot of games) and then grow out of them. But we began to learn that people didn’t grow out of them, but instead craved more complex mysteries and stories as they aged. This led to pivotal games like Myst and Riven, which started the modern video game trend of well-created story and making your players use their brains, not just their reflexes. At the current rate of consumption of complex and morally challenging video games, in the near future, they may well usurp the profits of the American Motion Picture industry—which, if you’re unaware, is still the most profitable export this country has. While video games showed that people didn’t just want to mindlessly consume things, most of our society missed the point and began to assume that any game concept outside of video games was going to go the way of the dinosaur—after all, why would people play board games or card games with other people, when they could now play flashy games on their computer or PS4 and not have to keep track of anything again. However, to everyone’s shock, the only games to experience a leveling off have been mass-market games like Monopoly and the like. For progressive, independent, and avant garde fair, board games have been growing massively. As of 18 months ago, the Deseret News reported that these boundary pushing, and often-niche focused games, have been experiencing between 10%-20% in sales every year for the last 10 years. Hasbro, the company who currently publishes Monopoly, made one of their smartest decisions to date when they purchased Wizards of the Coast, the creators of Magic the Gathering, in 1999 for $325 million. According to journalist Andrew Marder, in an article he did last year, Magic’s annual revenue—which has been amazing for the 20 years it’s been in existence—has been experiencing 182% annual growth over the last five years, bringing its revenue income to around $250 million a year. Magic’s lead designer, Mark Rosewater (popularly known as Maro, to Magic fans), has a column called “Making Magic” and a podcast called “Drive to Work” where he explores the behind the scenes elements of being part of this extremely powerful and creative venture. Rosewater, who’s been with the company for 18 of the past 20 years, points to the metagame as one of the extremely important parts of the games success. (For those unfamiliar with Magic, it’s a Collectible Trading Card game in which players can buy pre-constructed decks or build decks from randomized booster packs.) Due to a very strong tournament scene and regular releases of cards for Magic, people can create decks that play to their strengths since many of the cards interact with one another in intriguing ways. This element of things that can connect in new and sometimes lego-like fashion is part of the intrinsic metagame of magic, while figuring out the ideal configuration of legal cards in a tournament setting to beat the most opponents is part of the larger meta game. Having already realized the potential Geek & Sundry might offer to games even before the show, Wizards of the Coast had already been in talks about having G&S create a show that could help encourage a new breed of player for Magic: The Gathering. Debuting in 2013, “Spellslingers” with Day’s Sean Plots used easy to understand pacing, graphics to highlight rules, and humorous guests to encourage a whole new generation of people to try out Magic. The initial learning curve is the most difficult hurdle for potential players, but the show simplified the basics so people could quickly understand how the game played. 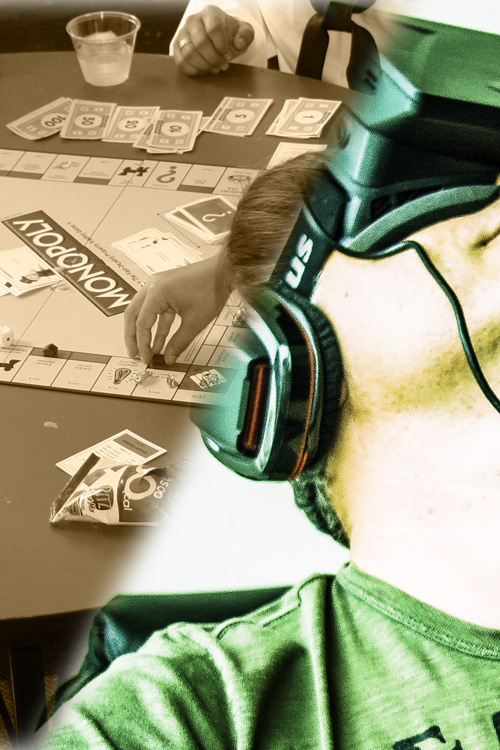 It was assumed that new tech like Oculus Rift would destroy board games. Edgy and Independent games, like this one based on the Game of Thrones franchise, have grown rapidly! Wil Wheaton helped shine a light on how much people want to physically game with his show, Tabletop. Mark Rosewater and the team at Magic have crafted a supremely challenging game that continues to grow rapidly! The MTG craze is enhanced greatly by shows like Spellslingers that teach the rules of the game with fun co-stars, like Mythbusters Grant Imahara! Tune back in next week when we look at how meta-stories bring video games AND board games into the real world! 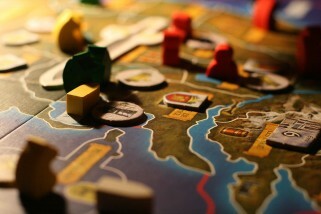 “A Game Of Thrones board game detail” by François Philipp – Flickr: A Game Of Thrones. Licensed under CC BY 2.0 via Wikimedia Commons. “TableTop” Logo owned by Geek & Sundry. All rights reserved. “MarkRosewater” by Mark Rosewater – http://markrosewater.tumblr.com/post/79178232240/i-release-this-photo-under-the-creative-commons. Licensed under CC BY-SA 3.0 via Wikimedia Commons. “Flickr – Official U.S. Navy Imagery – Sailors play board games with children at the Cameron Community Ministries during Rochester Navy Week” by Official Navy Page from United States of America MCC Steve Carlson/U.S. Navy – Sailors play board games with children at the Cameron Community Ministries during Rochester Navy Week. Licensed under Public Domain via Wikimedia Commons. The director of two feature length films and half a dozen short films, Jeremy Hanke founded MicroFilmmaker Magazine to help all no-budget filmmakers make better films. The second edition of his well-received book on low-budget special effects techniques, GreenScreen Made Easy, (which he co-wrote with Michele Yamazaki) is being released by MWP in fall 2016. He's curently working on the sci-fi collaborative community, World of Depleted, and directed the debut action short in this series, Depleted: Day 419 . Content Distributed under Creative Commons Attribution-NonCommercial-Sharealike (BY-NC-SA) License. Copyright © 2005-2014, MicroFilmmaker Magazine. Released under a Creative Commons BY-NC-SA 3.0 License. All other rights reserved.